Years ago I picked up "Rum" as a hobby. I know... rum can't be a hobby! It isn't a "thing"! But collecting rum can be a very GOOD hobby. I began to collect bottles of different types of rum. I bought a guide book about the many wonderful kinds of rum and where to buy them. I found them in our travels all over the Caribbean and I would pack home as many bottles as the law would allow. Imagine my surprise when our friends Katie and Dean volunteered to take us to visit the Railean Handmade Rum Distillery... right up the street in the neighboring town of San Leon, TX. I had heard about this small Texas distillery on Facebook (of all places) but didn't make the connection that they were near us here in Kemah. 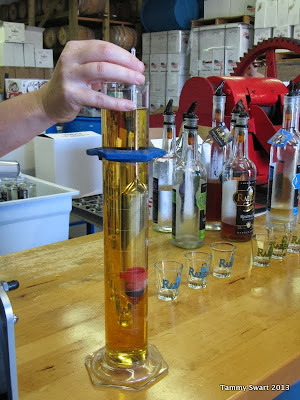 We headed out for a fun day starting with a distillery tour by the founder of Railean Texas Rum - Kelly Railean herself! Our tour started at noon and began with a look at the new (to them) sugar cane grinder. It isn't something they are using now, but they are toying with the idea of making a product from the cane juice. They currently use Molasses to make their rums. The smell in the building was deliciously subtle and sweet with it. Kelly was very proud of the "Made In America" mark on all of their boxes. She began her business as a hobby, much like mine. But with her background in the wine business, and her husband's in chemical engineering, her hobby took on a life of it's own. She took us through the entire process, starting with fermentation and moving on to the distillation. The company makes several types of Rum and have recently added a Vodka and a Blue Agave (like Tequila) to their label. She explained their aging process and how the different products remain casked for different lengths of time. 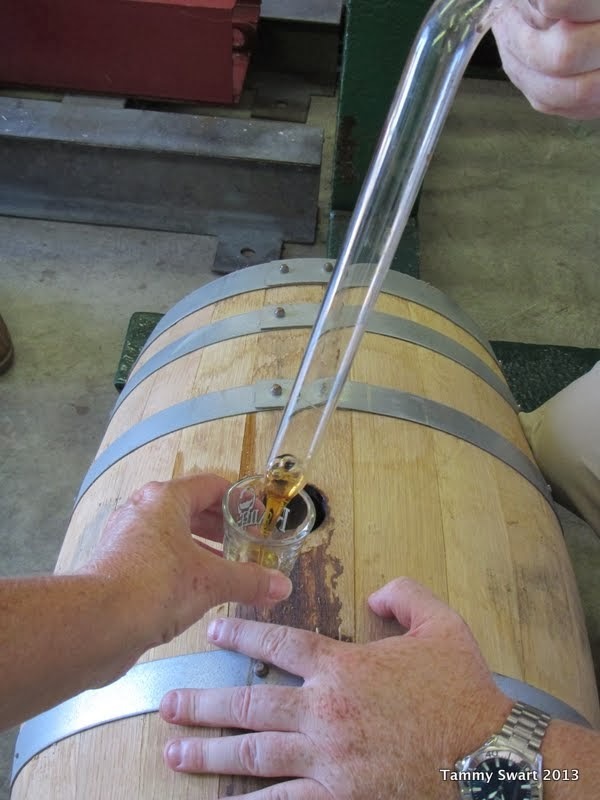 The barrels infuse color and flavors depending upon how long the product is aged. They have stacks of barrels just waiting for their time to come. The bung was removed and the alcohol dipped out. The distillery was quiet while we were there. The business of making liquor is heavily regulated and Kelly was in the middle of a recertification process that required her to shut down the distillery so that her equipment could be inspected. For us... this meant that we were in for a special treat! They don't usually give out samples directly from the barrels... but for US, they made an exception. They used a special glass tool to retrieve sips of the pure alcohol, full of oaky particles and whatnot... It was an eye opening experience! This was the straight stuff! 100% alcohol! Uncut! The flavor was marvelous! We were each given souvenir shot glasses to sample the many products made here. We got to see the vats in which the distilled alcohol was cut with purified water and mixed to create the finished products. We saw the bottling and labeling process. Each batch undergoes many testing and regulatory steps before it goes into the bottle. The final step is to test the alcohol level using this hygrometer. It's all very scientific and I was impressed by the fact that Kelly takes the process and the regulations very seriously in every step along the way. I asked about the difference between "alcohol content" and "proof" - 40% alcohol by volume is said to be "80 proof". Kelly told us a little bit of history. She said that early British sailors, suspecting that their alcohol was being watered down, began to test the amount of alcohol by adding gunpowder and lighting it on fire. The watered down alcohol would not ignite. When it did ignite, this was "proof" that the level of alcohol in their bottles was correct. Thank you Kelly for the tour and Katie and Dean for this day! We were given samples of each and every product made here and I will tell you that I'm not accustomed to drinking my rum straight! I normally require fruity accompaniments to tone down the strong taste of the liquor. I was amazed to find all of the Rums, and even the Vodka and the Blue Agave to be quite pleasant upon the palate. They were smooth and each one had a very distinctive flavor with beautiful aftertaste... They even smelled divine... scrumptiously sweet and warm. To say that this day was a treat would be a vast understatement! I can't believe the incredible luck we had in finding this little known gem. We each took home two bottles, only because that's all we were allowed! So, if you're ever in the Kemah area... hop on over and check out Railean Handmade American Rum. And tell Kelly that Dos Libras sent you! Very cool, indeed. I did not know that fact about the British sailors. But, being a Brit and a sailor, rum aboard is a necessity and not a luxury. I am true to my heritage. Fun to read about Kemah. We purchased our first boat from Kemah and kept it in Corpus Christi. Good memories. Yes it is a cool story. Google it to flesh it out a bit if you can't get by the Distillery. I did, but didn't want to spoil it for anyone. Kelly was an endless source of information about all things Rum. Thanks for your comment and for reading our blog!